RoboRaid was really fun to play. The first time I played it though I got frustrated. This was because it was late and I was no longer “tapping” my finger at the enemies, but instead I was pointing at them and almost using my finger as a wand. In my mind, at that moment, the faster I shook my finger at the enemies the better faster I should fire my laser. Instead, nothing happened, because I wasn’t using the right gesture (finger up, then bend it to tap). When I tried the game the second time, it worked great and I had a blast. Ever wanted to visit Rome or Peru? Well now you can from the comfort of your own room. It is very well done and I highly recommend it. I only recorded the very very beginning of this. It was really impressive and I may show more of this later. The combination of 360 degree video and the holograms were quite astounding. Would you like to build your own holograms? This cool tool lets you do just that. The tutorial takes a little while to go through and it will take some time to get used to manipulating the objects but it is a great app that lets you build your own 3D objects. 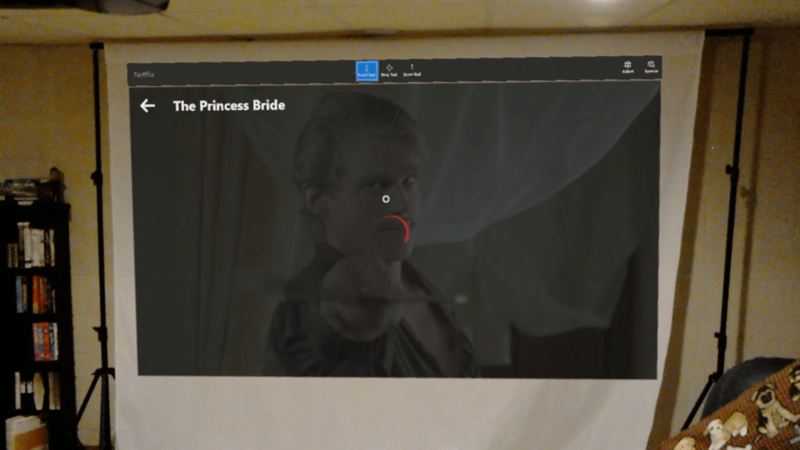 Unfortunately, using Cortana to record this video through the HoloLens itself caused some bad antialiasing effects. What I saw was much better. If I had to choose, I’d rather my video be sub par than the actual experience. I may try this again recording the way I did the RoboRaid and Fragment segments (by streaming). I’ll have a post and video about how I did this later today. This was the first app I opened when I turned on the HoloLens. I was able to place a virtual tiger on the floor, and a shark floating in the middle of my room. I then placed a stack of cups in my room to mainly hide some real world mess behind it. Later I realized it was a video I could play. Then a little later I realized that I could rotate the object and watch the video from all 360 degrees. I was blown away as was caught on my unboxing video. This game is awesome. I’ve only completed the first level and I want to get back to it, but work and creating these posts are keeping me from it… but not for long! The first chapter is awesome. I am going to play it again in a different room at some point to see how the game adapts to my surroundings. Having life size holograms talking to me and to continue to look at me as I walk around the room is really cool. Plus a mystery game is just awesome. Definitely check it out! This cool game changes with your environment but it has foul language that I don’t want my girls to hear. So I won’t be showing it to them unfortunately. Fragments has very strong language, but it isn’t a game that I would want to show them anyway. Young Conker could be really fun for a younger audience, but the language is the main reason it didn’t go in my top 10. The actual experience of the game was very fun though. Well this has nothing to do with Holograms, so why is it on the list? Simple – if you enjoy watching movies alone you can basically make a screen as large as your wall if you sit far enough back. 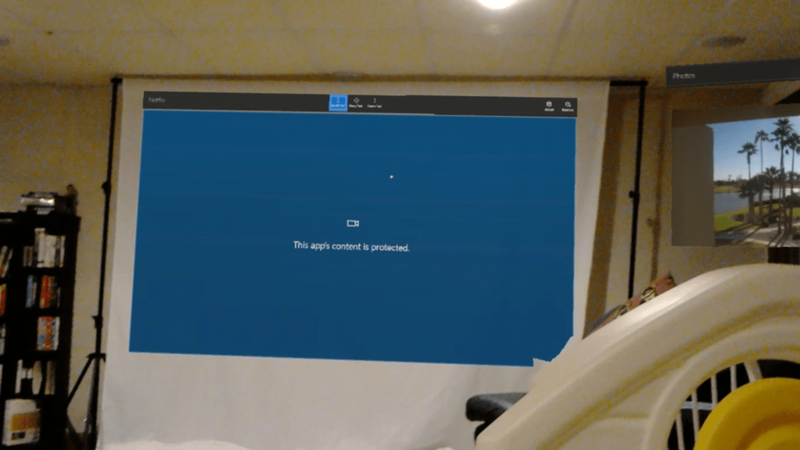 I was able to use the screen I use my actual projector and have the HoloLens display a much larger screen that I could fully see from my favorite seat. I’ve not tried to watch a whole movie this way yet. It could be too strenuous on the eyes, or it may not bother them at all. Time will tell, but just being to take any app that we have and pin it in our rooms is just plain awesome. This is the app that Microsoft created and made open source based on what the community wanted to see. It is a great looking app and you should definitely give it a try. I’ll be examining the source code very soon. The demos for this are great. However, when I tried to connect with my wife, she didn’t see any way to “Draw” on my environment. I’m assuming this was because she needed a beta version, but we couldn’t find it in the Windows Store. Still, she could see everything I was seeing and I could see her just fine. 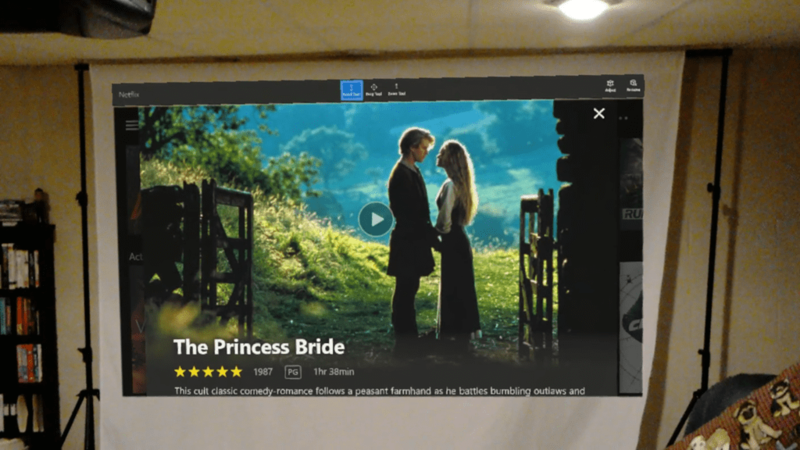 I was a little disappointed that by being in the Skype app, I couldn’t see (and therefore my wife couldn’t see) the holograms I had placed around the room. It makes sense because those are two different apps and currently the HoloLens only allows a single app to be running. I’m hoping this is something that will change sooner rather than later. This looked really neat, but in both times I started it, I had an issue with the placement. The first time, I don’t think I gave it long enough to load and I thought I just couldn’t find it. The second time, I gave it a little longer, but it basically put the hologram of the human body really high. I was basically looking at the feet and the head went “into the ceiling”. The interesting thing about the HoloLens is that you can see the entire thing even if your view should be obstructed from things like ceilings and floors. So that is my top 5 (well top 10 I guess) apps. I hope you are able to get your hands on a HoloLens and play around with these.